On November 29, 2018, Ellen R. Fitzwater retired as Chairwoman of the Board of Directors of F & M Bank Corp. after 19 years of service. The Board of Directors of F&M Bank Corp. appointed Michael W. Pugh as the new Board Chair. Mr. Pugh has served as a director of the Company for the past 24 years. 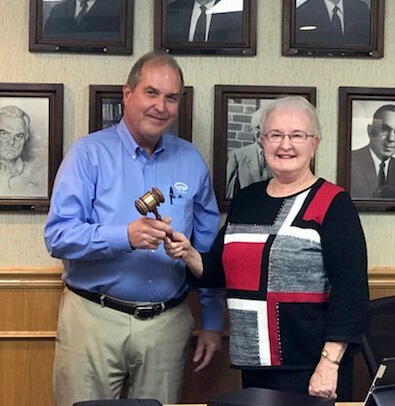 Attachment: “Passing of the gavel” from Ellen Fitzwater (right) to newly elected Chairman, Michael Pugh. F & M Bank Corp. operates as the holding company for F&M Bank, which provides commercial banking and financial services to individuals and businesses in Virginia. The company's deposit products include interest bearing and noninterest bearing demand, savings, and time deposits, as well as money market accounts. It also offers residential mortgage and construction loans; consumer installment loans; commercial loans, such as agricultural loans; and credit card loans. The company also provides title insurance, brokerage services, and property/casualty insurance to its banking customers. F & M Bank Corp., through its other subsidiary, TEB Life Insurance Company, reinsures credit life, and accident and health insurance. F&M Bank operates locations in Rockingham County, Shenandoah County, Page County, Augusta County, and the Cities of Harrisonburg and Staunton, Virginia. The company was founded in 1908, is headquartered in Timberville, and is the only publicly traded corporation based in Rockingham County, VA.
F&M Bank serves the Shenandoah Valley with 13 full-service branches, a network of ATMs, and a wide variety of financial services including home loans through F&M Mortgage and titling services through VS Title. Both individuals and businesses find the organization's local decision-making, and up-to-date technology provide the kind of responsive, knowledgeable, and reliable service that only a progressive community bank can. 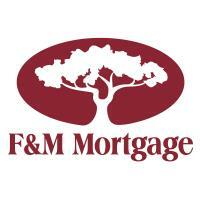 F&M Bank has grown to over $770 million in assets and boasts over 175 full and part-time employees. Its conservative approach to finances and sound investments, along with excellent customer service, has made F&M Bank profitable and continues to pave the way for a bright future.